Here is a depiction of a possible scene found in Alaska, minus the turtle. 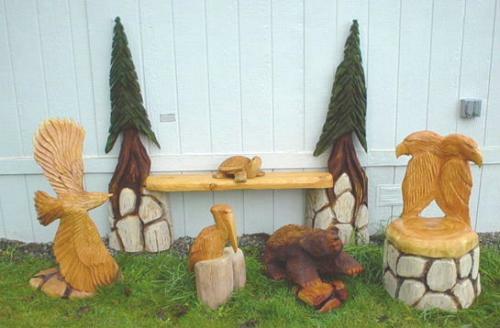 There are several different chainsaw-carved pieces of artwork including the American bald eagle in flight, a tree bench to rest the weary body after a long hike, a fun-loving bear cub who might venture into a campsite in search of snacks, and of course a highly popular pelican is popular for those clients who live close to the sea. The eagle head chair found its home in a lodge along the bluff of the Cook Inlet, AK. 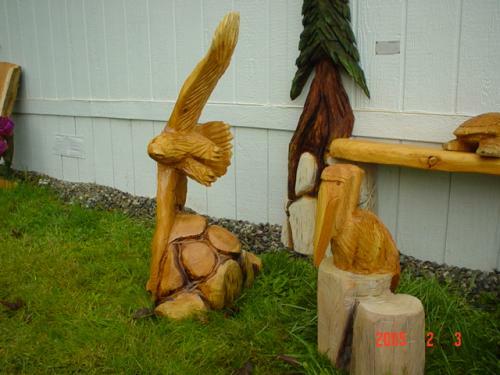 All of these chainsaw carved creations represent the beauty and serenity anyone can find in the forest. Chainsaw carved art is a wonderful way to remember that awe-inspiring vacation. A closer view of the pelican and soaring eagle chainsaw art.